Attempts to divest control of the Internet from the US government to a stakeholder group by September might not happen, according to a senior US policymaker, in an early acknowledgment that the issue is likely to be delayed. Officials close to the negotiating process told EURACTIV earlier this year that an international dispute over internet governance could be triggered if the transfer process is delayed. The Internet Corporation for Assigned Names and Numbers (ICANN), a United States-based organisation, is attempting to transfer control over internet address registration from the US government’s Department of Commerce to a group of stakeholders (see background). ICANN members include representatives from major web companies and domain name registries, governments and international organisations. The US contract with ICANN expires in September this year. Agreement rests on the Department of Commerce agreeing to the terms of ICANN’s reform proposal. But complicated discussions over how ultimate control of internet address registration would operate under the so-called multi-stakeholder model are still ongoing. US Department of State Ambassador Daniel Sepulveda acknowledged at a press conference in Brussels on Wednesday (15 April) that the transfer might not be completed by September, although he said he hoped that if it was not yet completed by then, “significant progress would have been made”. Internet governance was discussed within the 13th US/EU Information Society Dialogue held in Brussels on Monday and Tuesday (13-14 April) amongst a range of other issues relating to the digital economy. Ambassador Sepulveda led the US side of the debate with high-ranking EU officials. Sepulveda leads the US State Department’s positions on communications and information policy issues, and is close to the Obama White House. 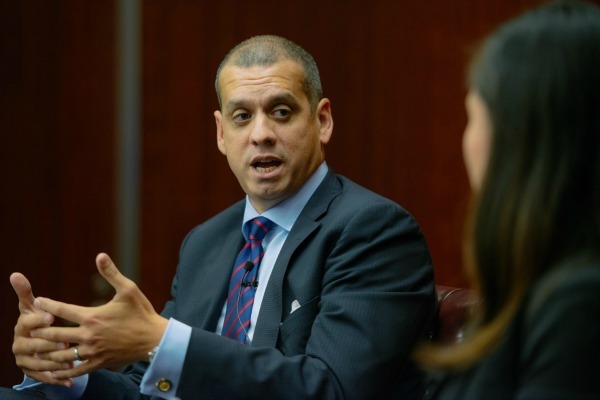 Sepulveda said that although agreement has been broadly reached on how the engineering and registration protocols relating to governance in a post-transfer period, there remains no agreement on the protocols around naming web sites. The issue is contentious, because such control could theoretically blackball a country from the web. American policymakers fear the process could be ‘captured’ by a cabal of unsympathetic countries. Officials attempting to reach a deal over the reform of Internet governance told EURACTIV earlier this year at the Mobile World Congress in Barcelona that delays and the “weaponisation” of the issue in the current US political climate are threatening to ignite an international dispute. “The delay threatens to bring the ghost of Dubai back to life,” one source said, referring to an abortive attempt to put ICANN under the control of the International Telecommunications Union (ITU), a UN body, during an overhaul of that organisation’s rules which took place in 2012. The effort to update the ITU rules giving the organisation ICANN’s powers collapsed in December 2012, after six EU member states joined the United States and Canada in refusing to agree a text at the World Conference on International Telecommunications (WCIT) in Dubai. The US was concerned that references to the Internet in the treaty might be used to legitimise censorship and – more controversially – enable commercial negotiations between telecoms networks and so-called ‘over-the-top providers’, especially large internet technology providers, such as Google and Microsoft. “Some of those countries which supported the US back then will change their minds and start pushing for the process to be put into the hands of the UN if the process starts to drag on into 2016,” a source told EURACTIV. “The problem is that some countries suspect that the US is just playing everyone along, and has no intention of really relinquishing control, and if the issue drags into next year they will claim they have been proved right,” another said. Europe’s position will be crucial in the coming months, the sources said, since European support for the US at WCIT was patchy, but decisive, and that position could change if the predicted delay occurs. ICANN officials have begun touring European capitals to survey opinion on the latest drafts of reform proposals. The campaign for the election which will take place in November 2016 will be fully under way by early next year. A previous policymaker for former US President Bill Clinton strongly associated with the National Council of La Raza (NCLR) – the US’s largest Latino organisation – Sepulveda would be well placed to segue into a new administration, if Hillary Clinton’s presidential bid were successful. Like telephones, the Internet relies on numbers which identify computers and allow them to connect to one another. This identification process is coordinated at global level by ICANN, the Internet Corporation for Assigned Names and Numbers. ICANN was established as a not-for-profit corporation in 1998 with the backing of Washington. The agreement with the US administration has been renewed every three years up to the last renewal, signed in 2006. ICANN is responsible for defining Internet domains, such as .com or .eu and for managing the Internet core directory. The EU and other countries around the world have acknowledged the success story of the US-born Internet, but have increasingly challenged the United States' sole control of Internet governance.